The meaning of the Hindu "festival of lights" becomes clear to a young boy. Ricki is looking forward to Divali, the Hindu "festival of lights." He's also waiting for two special rosebuds to bloom—buds on the bush his grandfather had planted in the front yard. 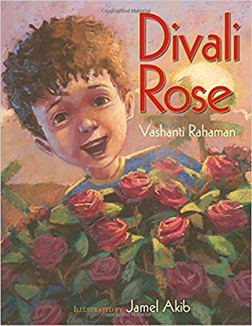 Grandfather promises that the roses will be the color of Divali, but Ricki can't imagine what color that might be. One morning, Ricki bends one of the rosebuds to get a closer look and accidentally snaps it off. When his grandfather believes the new neighbors have stolen his rosebud, Ricki must summon up the courage to confess what he has done. Set in Trinidad, this moving story reflects the significance of a festival that is celebrated by nearly one billion Hindus worldwide.